Kitab al-Injil as-sharif at-tahir wa-al-misbah al-munir al-zahir. Al-Shuwayr, Kisrawan, Lebanon, Kloster des Heiligen Johannes des Täufers, . - Folio (213 x 322 mm). (4), 316 pp. Parts printed in red and black. With numerous ornamental lines and several woodcut tailpieces. Modern half calf. "The Evangelion of the Greek Church, containing the Gospels arranged for liturgical reading throughout the year" (Darlow/M.). From the printing office of the monastery of St. John the Baptist at Shuwair in the Lebanon, which was operative between 1734 and 1899 (cf. Silvestre de Sacy I, pp. 412-414; Middle Eastern Languages and the Print Revolution. A Cross-Cultural Encounter, Westhofen 2002, pp. 179-181). Particularly remarkable in this present publication is the typographic decor: all pages are framed by double rules; new sections of text are headed with an ornamental line of floral elements across the entire page width, and numerous pages show smaller figural endpieces (roses, baskets, crosses, as well as the Virgin with the Child Jesus) - a charming juxtaposition of simple woodcuts showing floral and geometrical decor familiar from the Hebrew prints produced in 19th-century Palestine with the more elaborate products "à la italienne". - Some occasional worming, browning and brownstaining. Schnurrer 360. Darlow/Moule 1661. 1776. (AMERICAN REVOLUTION) MASSACHUSETTS GENERAL COURT.In the House of Representatives, November 1, 1776. Ordered, That the following ADDRESS from the General Court of this State, to the Officers and private Soldiers who are gone from thence and are serving in the American Army, be printed in two thousand hand-bills, and immediately forwarded to the committees from this state in the southern and northern armies, to be dispersed among the soldiery there…. [Boston: Printed by Benjamin Edes], 1776.A rare November 1, 1776 broadside address issued by the Massachusetts government as a message of inspiration and encouragement to the Massachusetts troops fighting in the Continental Army. The soldiers are promised shipments of needed supplies, they are reminded of the great cause for which they are fighting, and they are warned of the grave dangers that will befall them and their families if they quit their posts.Massachusetts was the center of opposition to British colonial rule and the focus of Britain? 's most oppressive economic policies and military actions during the early years of the Revolution. The war began in April 1775 with Lexington and Concord, after which the British occupied Boston until March 1776. In January 1776, Massachusetts reorganized its militias, replacing the loosely-structured volunteer army of 1774-5 with a more permanent and formal organization. The new militia regiments were organized into county-wide brigades and included all able-bodied male citizens between 16 and 60. In addition to providing local defense and training, these regiments served as the primary source of reinforcements for the Continental Army throughout the war. ? "One-fifth of most militia units in Massachusetts were drafted in September 1776 for service in the Continental Army until dismissed?" (Ward, The War for Independence, 111). However, there were numerous and serious problems with the Massachusetts soldiers and officers, including difficulties with paying and supplying them, as well as recruiting and keeping them. Desertion was such a problem that on October 24, 1776, the Massachusetts legislature passed a resolution requiring sheriffs to help the Committees of Correspondence, Inspection and Safety ? "for the purpose of apprehending and securing any deserters from the army, that shall be found within their limits.?" On the morning of October 31, 1776, the Massachusetts House of Representatives appointed four men to the committee to write this address to the ? "officers and private soldiers belonging to this State, and now serving in the American Army.?" On the afternoon of the next day, November 1, their reports were read and accepted, and on November 2 it was ordered that ? "two thousand hand-bills?" of this address be printed and immediately distributed to the soldiers. The address gives the soldiers stirring and patriotic reminders of the reasons they are fighting this war: ? "When the tyrants of the earth began to transgress the sacred line of property, and claim their fellow men as slaves, and to exercise lawless power over them, the intentions of government were subverted, war in defence of the dignity of human nature was introduced, and men began to take the field of battle on behalf of freedom…. For the free exercise of liberty, more especially in the worship of that almighty Being who supported them in the greatest distress, our venerable ancestors came to this land when it was a savage and dangerous wilderness, terrible to the civilized eye. Here they toiled and bled, with the pleasing hope of their posterity? 's enjoying that freedom for which they encountered every difficulty, and braved every danger, and could their virtue have been inherited with the fruit of their toil, and their simplicity of manners and integrity of heart been transmitted to all their posterity, America would now have been the seat of peach and plenty. But such has been the avarice of some, and the ambition of others, amongst us, that the King and Parliament of Great-Britain have been fatally persuaded to claim this whole continent, with its three millions of inhabitants, as their own property, and to be at their disposal. In opposition to this unjustifiable claim most obviously founded in tyranny, after loyally petitioning, and dutifully remonstrating without effect, you have gallantly taken the field, and the salvation of your country, the happiness of future generations, as well as your own, depends upon your noble exertions.? "The soldiers are assured that they will be sent the supplies they need (? "supplies of covering, cloathing, vegitables, and all other necessaries of your comfort…? "), but then are gravely warned what will happen if they desert their posts: ? "[We] do intreat and urge you by the sacred ties of blood and friendship, to exert every nerve in this glorious struggle; for should you for any reason quit your posts, and disgracefully turn your backs on your enemies, wild carnage, barbarous and bloody desolation must spread like a hideous torrent over your ruined country: Your fair possessions the fruit of hones industry, must own new masters; while yourselves, your friends, your wives and innocent infants must be destitute of a place of rest, insulted and abused by exasperated unfeeling task-masters, scourged by mercenary slaves of foreign despots, denied even the happiness of hope, and borne down with poverty and despair.?" They are also promised the gratitude of their fellow citizens for their efforts: ? "When the people of all ranks in this country, consider the zeal with which you engaged in their defence, and how cheerfully you have endured the fatigues and hardships of the camp, they must be filled with the highest gratitude, and confidence, and enroll your names where they will be honourably preserved to the end of time; while each generation as it rises, shall learn to speak the same of those worthies, who nobly dared to face that death and despite that danger, which stood between them and their country? 's happiness…. And while you are thus gallantly employed in the most important and noble cause that any part of the human race has fought for, this Assembly again assures you that it shall be their particular concern to give you comfortable supplies and necessary reinforcements;… you will be crowned with a glorious victory, and return honourably from the field, bringing deliverance to distressed AMERICA.? "The two most important men on the committee that wrote this address were James Sullivan and Joseph Hawley, both lawyers and close friends of Samuel Adams. Sullivan was a Justice of the Massachusetts Supreme Court, and later became Attorney General and Governor of Massachusetts. Hawley was one of the most important leaders and persuasive writers of Massachusetts and its legislature, and his name appears on many of the committees for drafting state papers. In the fall of 1776, Hawley and Sullivan were appointed to the most significant committees (those concerning military, political, or legal matters) to write important papers for the legislature and the public, including this address to the Massachusetts solders ? "that they might become more contented and zealous in the service?" (Amory, Life of James Sullivan, pp. 87). Hawley would have had a major role in this address, and his writings had ? "the loftiest eloquence, [and] aroused, even in the bosoms of the cold and the calculating, a determination to sacrifice every feeling of self upon the altar of liberty.?" (Amory, p. 93)Joseph Hawley, Samuel Adams, and John Adams frequently corresponded, and each was an important influence on the others. Hawley was one of the earliest and strongest advocates for independence, and in 1774 he and Samuel Adams were chosen as Massachusetts delegates to the Continental Congress; when Hawley declined because of ill health, John Adams was sent in his place. Hawley wrote repeatedly to the Adamses and the other delegates to persuade and pressure them to declare independence and create a Continental government. In 1776, ? "his constant agitation for a declaration of independence and his steady attention to military problems were his work?" (Brown, Joseph Hawley, pp. 144, 156). While Samuel Adams and John Adams did not play a direct role in the writing of this address, their influence can be seen, as they and Hawley corresponded regularly about political and military matters. Samuel Adams and Hawley collaborated on the most important writings of the legislature, and ? "no document… went forth until both had carefully considered it… Adams oftener consulted him on legal points than any other man, and it is probable that neither penned any very important public paper without the revision of the other?" (Wells, Life and Public Services of Samuel Adams, II: 31, I: 126-127). On August 25, 1776, John Adams wrote to Hawley about serious problems with the Massachusetts military, including the ignorance of the officers and the lack of understanding of the principles of liberty, which could have influenced the writing of this address: ? "Knowledge is among the most essential Foundations of Liberty…. To what Cause shall I attribute the Surprising Conduct of the Massachusetts Bay? How has it happened that such an illiterate Group of General and Field officers, have been thrust into public View by that Commonwealth… [which] ought to have set an Example… by sending into the Field her ablest Men, Men of the most Genius, Learning, Reflection, and Address… This Conduct is sinking the Character of the Province… and is injuring the service beyond description. Able officers are the soul of an Army…. There is another Particular, in which it is manifest that the Principles of Liberty have not sufficient Weight in Mens Minds, or are not well understood….? "Ford, Massachusetts Broadsides 1999. Evans 14868. NAIP w034161.Some browning and spotting, reinforcement to separations at old folds. Michaelis, Johann David, Theologe und Orientalist (1717-1791). Eigenh. Schriftstück mit U. ("Michaelis"). [Göttingen, am/kurz vor dem 20. VI. 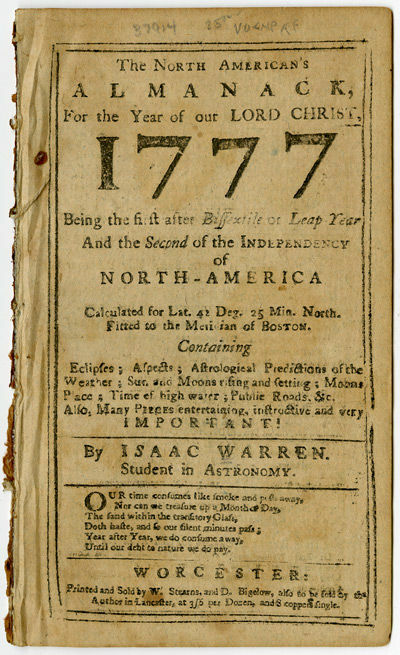 1776].. ½ S. Folio.. In einer Streitsache zwischen seiner zweiten Frau, Louise Philippine Antoinette Michaelis (1739-1808), und einem Bedienten: "Die Antwort, die ich dem Bedellen gebe ist: meine Frau acceptire den Eid, der ihr deferirt ist, doch so daß vorher der Bediente, Köethe, das jurament der Gefährde abschwöre. Hierbey stellte Ihro Magnificenz anheim, ihm vorher diesen Eid hinlänglich zu erklären, und ihm begreiflich zu machen, daß auch dieser Eid ein Meineid seyn könne, und wol gar ein vorwißlicher, wenn er sich bewußt seyn sollte, noch gegen mehrere selbst gesagt zu haben, daß er auf ein Jahr im Dienste sey. Wenn das Jurament der Gefährde abgelegt werde, wünschte ich dabey zu seyn [...]". - Gefaltet; Praesentatum-Vermerk vom 20. Juni 1776. - Sehr selten. London: Printed for Richardson and Urquhart, 1776. First edition. xii, 197, [9, index], [5, ads],  pp. 12mo. Later reverse calf and patterned cloth boards, contemporary red morocco spine label preserved. Text browned, title page lightly edgeworn. First edition. xii, 197, [9, index], [5, ads],  pp. 12mo. A gardening manual arranged according to the months of the year. The author, Thomas Ellis, was gardener to Lord Bishop of Lincoln. Ordenanza de S. M. para el Gobierno Militar, y economico de sus REALES ARSENALES DE MARINA. Dividida en dos tratados. 1776. 1776-1777 Day Book of London Attorney With Entries Concerning a Land Deal in Florida [Manuscript]. [London Attorney]. Day Book. [S.n. (but no doubt London), October 1776-November 1777. c. 200 ff., 22 ff. filled with content on rectos and versos. Folio (12-1/2" x 8"). 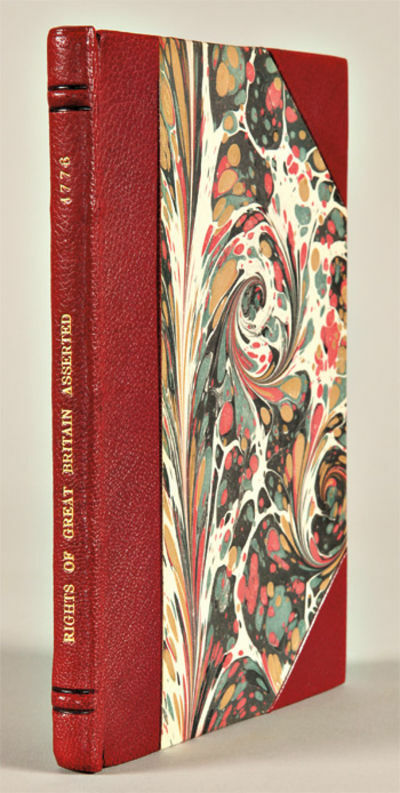 Contemporary vellum, hand-lettered title and date to spine and front board. Moderate soiling, some rubbing to extremities with wear to head and tail, front hinge cracked, bookseller ticket of London dealer Richard Blamire to front pastedown. Light toning to text, content written in neat hand on red-ruled leaves. An interesting item. * Though unsigned, this day book was clearly the work of a London attorney. Folio 11 has an interesting entry concerning a conveyance in Florida: "Took Instructions to draw conveyance of Lands in *FLORIDA* (sic) under Grant of Mr. Tompson." Florida was ceded to Britain 1763 but taken by the Spanish in 1781 and guaranteed to them 1783. (It was ceded to the U.S. in 1820.) Many of the entries concern property transactions. Others illustrate the pressures of the lawyer's life. For example, an entry of Folio 5: "Mrs Cheasley being very bad Mr Ward came & desired I would go down immediately & get Power of Attorney executed. Mr. Thompson & self went in a chaise & 4 at 10 (o'clock) at night & returned next Day at 2 (o'clock) & got Power executed'; Fol. 21: '..the whole of this day with them & at my House till 11oC at night." This lawyer worked with a variety of individuals. He notes, in Fol. 10, that he met with a Mr. Atkinson concerning "the Payment of Prize Money in his hands to distribute." In Fol. 15b we see he "Attended Mr Child (the banker) re an account, their refusal to pay a client's bill &c." A note in Fol. 20b may relate to the noted legal historian Francis Hargrave [1741-1821]: "Attd. Mr. Hargrave & took his Draft for the money." An entry on Fol. 13: "Ent'd. in Waste Book Fo 67" above an entry crossed through in this volume suggests this book was one of a series of records kept by the lawyers concerned.. Le Commerce et le Gouvernement, Considérés relativement l'un à l'autre. Ouvrage élémentaire. (Commerce and Government, Considered in their Mutual Relationship. Basic work.). [Watertown], 1776. 4to.. "Pamphlet, [Peter Thacher, An Oration Delivered at Watertown, March 5, 1776: To Commemorate the Bloody Massacre at Boston: perpetrated March 5, 1770. ([Watertown: Printed and sold by Benjamin Edes, on the Bridge, 1776]), 13 pages, small 4to, (lacking first two leaves), bound in string. With ownership signature ""W Jennison's"" together with further ink emendations on the first extant page and the blank verso of the final leaf. Creases, some moderate toning from a dampstain, marginal wear, else good condition.A remarkable oration delivered by the Reverend Peter Thacher (1762-1802), then serving as pastor of the First Church at Malden (1777-1784). From 1785 until his death in 1802, Thacher served as pastor of the Brattle Street Church in Boston. The oration opens (with period spellings retained): ""MY FRIENDS, WHEN the ambition of Princes induces them to break over the sacred barriers of social compact, and to violate those rights, which it is their duty to defend, they will leave no methods unessayed to bring the people to acquiesce in their unjustifiable encroachments. IN this cause, the pens of venal authors have in every age, been drawn with Machiavellian subtlety, they have laboured to persuade mankind, that their public happiness consisted in being subject to uncontrouled power; that they were incapable of judging cornering the mysteries of government; and that it was their interest to deliver their estates, their liberties, and their lives, in to the hands of an absolute Monarch..."" Thacher's oration continues, recalling the battles at Lexington and Concord, as well as the sacrifice of Joseph Warren at Bunker Hill which most have proven compelling to his audience: ""THIS Day, upon which the gloomy scene was first opened, calls upon us to mourn for the Heroes who have already died in the bed of honour, fighting for GOD and their country. Especially, does it lead us to recollect the name and the virtues of General WARREN!"" Thatcher then casts to the north, to ""the Canadian wilds, and come to the plains of Abraham, where WOLFE once fell, we are there again compelled to pay a tribute to exalted merit, and to lament the fall of the great MONTGOMERY!"" Most importantly, this pamphlet contains an early call for independence? "a movement which had been just gaining momentum with the publication of Thomas Paine's Common Sense less than two months before: ""WITH transport, my countrymen, let us look forward to the bright? "day, which shall hail us a free and independant state. with earnestness let us implore the forgiveness and the patronage of Being of all beings, who holds the fate of empires in his hands! With zeal let us exert ourselves in the service of our country, in life: and when the early scene shall be closing with us, let us expire with this prayer upon our quivering lips, O GOD, LET AMERICA BE FREE! ""Extremely Rare. Evans 15101; Sabin 95172; T. R. Adams, American Pamphlets, 229. Evans notes four editions of this pamphlet in institutional collections including The American Antiquarian Society, British Museum, Massachusetts Historical Society and New York Public Library. 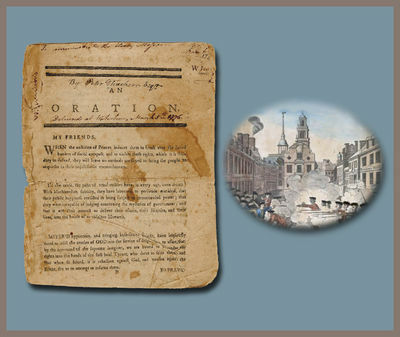 Not only is this a particularly rare Boston Massacre oration, delivered in one of the most critical phases of the American Revolution, but this copy was owned by a veteran of the Lexington Alarm, and a participant in the Siege of Boston, William Jennison (1757-1843). On the first page Jennison added some salient details gleaned from the now missing first two leaves, remarking that the address was intended ""To commemorate the bloody Massacre at Boston Mar 5, 1770"" and ascribing the oration to ""Peter Thacher Esqr."" and adding that it was ""Delivered at Watertown, March 5, 1776."" His son, William Jennison III (1759-1866), who for many years served as a justice of the peace in Worcester, has added his ownership signature, ""W. Jennison's. ""Jennison, who was born in Mendon, Massachusetts, marched as a sergeant with his father's minuteman company on the Lexington Alarm on April 19, 1775. In May he was attached to Joseph Read's (Reed's) 20th Massachusetts Regiment serving as its quartermaster until December 1775. In May 1776, Jennison was commissioned a lieutenant of marines and assigned to the frigate Warren, but relinquished the appointment to join Colonel Smith's Massachusetts Regiment for five months, seeing action at the Battle of White Plains. In February 1777, Jennison entered the naval service again, this time as midshipman and sergeant of marines aboard the frigate Boston, which captured the British frigate Fox off Newfoundland. He became a lieutenant of marines in December 1777, and the following year, in October 1778, he sailed to France to convey John Adams to Paris. Jennison became a purser the next month and remained in service aboard the Boston until its capture at Charleston, South Carolina in 1780. After the war, Jennison settled in Boston. (NARA M804. 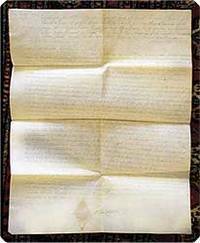 Revolutionary War Pension and Bounty-Land Warrant Application Files, ""Jennison, William. "")On the blank page at the end, sometime around 1810, the elder Jennison has added a short history of the Boston Massacre, likely for the edification of his son and namesake: ""On the Monday evening the 5th of March 1770 a party of Indians British Soldiers of the 29th regiment of foot under the command of Capt. Preston, fired on the Inhabitants of the town of Boston; whereby 5 were killed, and 7 wounded; two of the latter soon died, the others after some time recovered, &c. See mention of this in Cooper's history of Greece Rome North (and South) America- published in one octavo volum[e] by Joseph Avery of Plymouth in 1808 W J. The names of those 5 killed were - Crispus Attucks - Samuel Gray - Samuel Maverick - [James] Caldwell and Patrick Carr - The Court at which the murderers were tried was holden before the Honl Benjamin Lane - John Cushing[,] Peter Oliver and[d] Edmund Trowbridge Esqrs. Justices of the Superior Court of judicature - court of assize and general gaol deliver, held at Boston, by adjustment, on the 27 Novr. 1770 ?" W. J."" "
Worcester: Printed and sold by W. Stearns and D. Bigelow, .. pp. 12mo. Dbd. Light foxing and soiling. Very good. Revolutionary-era almanac by Isaac Warren, featuring a map of the forts at New York. Also included are lists of roads, pieces of verse, an account of Peter the Great, and the "Celebrated Speech of Galgacus...worthy of the attention of all officers and soldiers in the American Army" (p.). The North American Imprints Project notes that while Evans is correct in calling the almanac "essentially the same" as Samuel Stearns' NORTH-AMERICAN'S ALMANACK for the same year with regard to the prose matter and the map, the calendar is entirely different from that of Stearns. DRAKE 3269. EVANS 15212. NAIP w025152. London: Printed for J. Cooke, 1776. Book measures 14 x 9 3/4 inches. Collation, 720pp, 96 plates, including folding map. Lacking 5 plates. Bound in full period calf. Calf rubbed, worn, top board detached. Interanlly, 3 or 4 page of text torn without loss, pages and plates in very good clean condition. Binding could be repaired, being sold as an incomplete copy. Fine engraved plates. . First Edition. Good. Folio - over 12" - 15" tall. Lebanon. April 1, 1776.. p. Old fold lines. Minor wear and soiling. Very good. 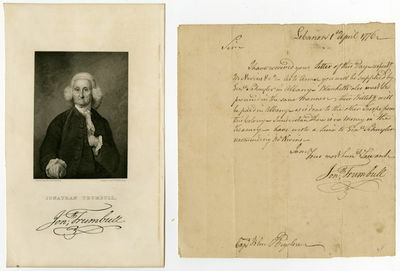 Letter written by Connecticut governor Jonathan Trumbull to Capt. John Bigelow concerning supplies to be provided for the Connecticut colonial regiments of the fledgling Continental Army. Trumbull writes: "Sir, I have received your letter of this day respecting Mr. Nevins, &c. As to arms you will be supplied by Genl Schuyler in Albany. Blankets also must be procured in the same manner. 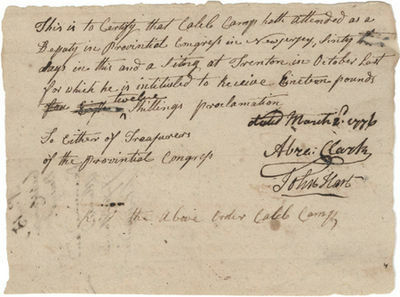 Their billets will be paid in Albany, as is done to the other troops from this colony. I understand there is no money in the treasury. Have wrote a line to Genl Schuyler recommending Mr. Nevins." Revolutionary troops were chronically short on both supplies and funding. An early piece of correspondence from the first year of the Revolutionary War, which began in April of the previous year. [Rotterdam], 1776. With 22 pen-and-ink and watercolor maps, numbered in gilt, each with facing-page manuscript legend in pen and ink and gilt. ll. Oblong 8vo (12 x 16.5 cm). Contemporary dark green morocco, covers tooled in gilt with double outer border, inner corner pieces, and central medallion, all composed of small floral and insect tools, spine with three raised bands, compartments gilt with small floral tools, all edges gilt and gauffered with small repeating dots, marbled endpapers, by the "Bosch-binderij" in Rotterdam. Very slight wear to joints at corners. Small booklabel and bookseller's desciption on ffep. With 22 pen-and-ink and watercolor maps, numbered in gilt, each with facing-page manuscript legend in pen and ink and gilt. ll. Oblong 8vo (12 x 16.5 cm). A beautiful album of manuscript and watercolor maps, in a fine contemporary Rotterdam binding. Comprising one world map, four continent maps (the final map shows North and South American together) and seventeen maps of European countries. The maps are executed in pen and ink and colored in yellow, blue, pink and green. The facing-page of manuscript text presents the map title and political divisions, expertly done in a mix of Roman, cursive and textura, with decorative capitals and gilt embellishment. Van Zwÿndregt (1753-1823) belonged to a family of master shipbuilders in Rotterdam - his grandfather, father and two uncles were shipbuildres, while his father and one uncle were also known as ship and ship-equipment draftsmen. The maps are copied from Geographische Oefening schetzende de geheele aardrykskunde, a popular geography primer which appeared in various Dutch and French editions prior to 1776. Augsburg. .. Handcolored engraving, 11 1/2 x 16 1/4. Sheet size: 12 3/4 x 18 1/2 inches. Light toning and foxing. Small tear at top of sheet repaired, not affecting image. Colors still quite bright and fresh. Very good. 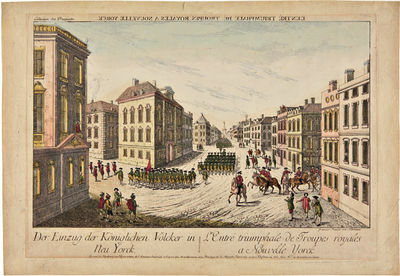 View of the British entering New York from a series called "Collection des Prospects," popularly known as "Vues d' Optique," published by engraver François Xavier Habermann in Augsburg in 1776. Reverse text above image reads: "L'Entre Triumphale De Troupes Royales a Nouvelle Yorck." Text below the image, in both German and French, reads: "Der Einzug der Koniglichen Volker in Neu Yorck / L'Entre Triumphale de Troupes royales a Nouvelle Yorck." Many of the "Vues d' Optique" were imaginative, crude, and inaccurate, although some were very well done. In this case the buildings are rather more elegant than those of New York in 1776 probably were. The letters above the text were deliberately reversed since these prints were designed for viewing in optical machines with a magnifying glass and a reflective mirror, which gave the viewer an illusion of depth and reversed the image. Accompanying the print is a 1943 letter from the Curator of Prints at the Metropolitan Museum of Art in New York describing the series of "Vues d'Optique" with New York subjects. Habermann also produced views of Boston, Philadelphia, and Salem. PRINCIPIOS MILITARES en que se explican las operaciones de la guerra subterranea, o el modo de dirigir, fabricar, y usar las minas y contra - minas en el ataque y defensa de las plazas. Barcelona, Eulalia Piferrer Viuda, 1776.Dispuestos para la instruccion de la ilustre juventud del Real Cuerpo de Artilleria. 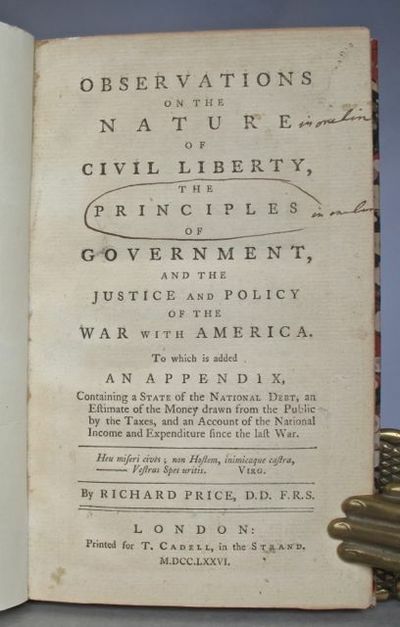 FIRST EDITION, 1776. 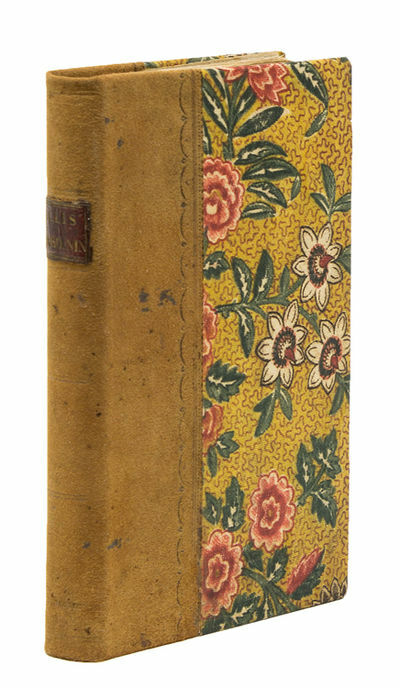 Small 4to, approximately 210 x 140 mm, 8¼ x 5½ inches, 24 folding engraved plates and plans, pages: (30), 286, Spanish text, bound in full antique mottled leather, raised bands and gilt decoration to spine, gilt lettered morocco label, all edges red, marbled endpapers. Head and tail of spine and corners slightly rubbed, cover edges slightly worn, several scrapes to surface of upper cover, ink ownership stamp to half - title, top of title page and lower margin of page 15, small correction to 2 words, few pale brown marks to final page of text, small light stain to lower blank corner of last 4 plates, otherwise contents fine and bright, a couple of plates protruding slightly from text block. Binding tight and firm. A very good copy. A scarce Spanish technical military book. The author Don Raimundo Sanz is described on the title page as Cabellero del Orden de Santiago, Mariscal de Campo de los Exercitos de S. M., y Coronel del Real Cuerpo de Artilleria. MORE IMAGES ATTACHED TO THIS LISTING, ALL ZOOMABLE, FURTHER IMAGES ON REQUEST. POSTAGE AT COST. York: J Dodsley, 1776. New Edition.. Hardcover. 4to. (12 x 9.5 inches). Unpaginated introductory sections, including list of subscribers, pp.649, unpaginated Index. Engraved portrait frontis by Bartolozzi, forty engraved plates, one folding, plus folding table at rear, some faint toning to plates. Marbled endpapers. 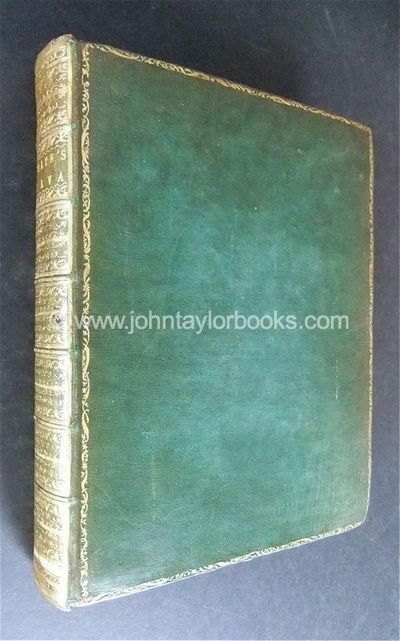 Contemporary green morocco, a little rubbed and partially faded, gilt decorated spine. O/w contents clean and bright. Binding firm and square. A handsome copy. Hunter Edition. Heavy book, requiring eye-watering amounts of extra postage overseas. We reduce the default shipping charge for lighter books or use it for a tracked service if books are expensive or uncommon. We pack books securely in boxes, or corrugated card or cardboard, and protect corners with bubble-wrap. 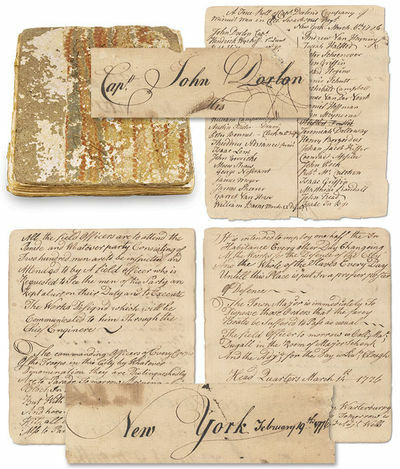 Philadelphia: John Dunlap, 1776. First Edition. Wraps. Good. First Edition. -36 pages. Self wrappers. Stab-stitched. 4 x 6 3/4 inches. Elaborate woodcut/engraving on the front panel with a second smaller cut on page 5 of the anatomy of a man's body as governed by the constellations. Wear to the extremities, and inked names in the margins throughout. The surname appears to be "Deavs" although it is most likely Deaves. Given names include Martha, Priscilla, Abraham and Samuel. A typical note is "Abraham Deavs His Hand and Pen wreth month 23 1777" as found on page 11. Wraps. Almanacs from this period are rare in the marketplace. Drake (1034) records 3 different page counts with 36 pages noted at three locations. Evans 15062; Hildeburn, C.R. Pennsylvania, 3494; Drake Almanacs Vol 2 #10034. 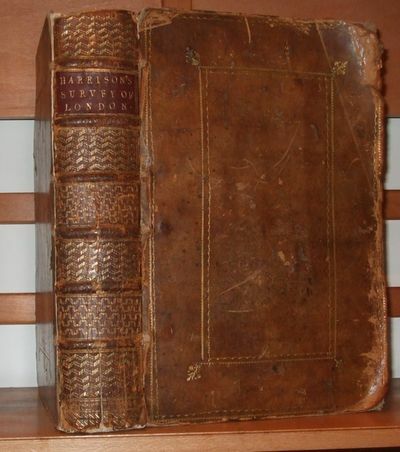 London: for the Editor: Sold by J. Almon... and Fletcher & Hodson, 1776. Occasional gentle foxing yet an excellent copy.. Quarto, with the errata leaf; a fine copy in full tree calf by Aquarius. Extremely rare: the first of two editions of this account of Cook's second voyage, perhaps the most bizarre of the whole series of surreptitious accounts of the three Cook voyages.Attributed at first to Cook himself, and in the second edition to "An Officer on board", the book may well have been, as Forster claims in his Voyage Round the World, the work of a Cambridge undergraduate. Nevertheless, and despite the fifteen falsely reported events identified in the Monthly Review for October 1776, it was certainly at first received as a serious report of Cook's second voyage, a full year before publication of the official account.Beaglehole admits that 'it recounts a few incidents, not otherwise known, which do not seem out of key with the voyage as a whole', but maintains that 'the rest is so palpably fake, and in the most sensational terms, that it must be regarded as original invention - on the basis, perhaps, of a reading of Marra or conversation with a stray sailor...'.The "officer's" account must not have achieved the sales that were expected as five years later it was reissued with a new title-page, otherwise made up from the same printing (Holmes, 39). Davidson points out 'the rarity of either edition of this anonymous work' and notes the cataloguing of a copy of this first edition by Maggs Bros. in 1950 at £85, described as 'excessively rare'. Beaglehole, II, pp. clv-clvi; Beddie, 1245; Hill, 1545; Holmes, 21; O'Reilly-Reitman, 381; Rosove, 214 (n). Document signed on parchment, in English. "Exemplification of a common recovery with double vouchers of the messuage & plantation in Blockley late the estate of Morton Garrett." Philadelphia Folio (51.5 cm, 20.5"). p.. 1776 Document relating to strife between John Ord and Gunning Bedford (probably not the Constitution signer but rather his cousin; both Bedfords were born in Philadelphia, a few years apart) over a Philadelphia-area property and its rents. Written in March of the "sixteenth year of the reign of" George III and the year of the Revolution, this was filed before Samuel Ashmead, justice of the Court of Common Pleas; the document is indited in a fine, light hand, and signed by Samuel Mifflin, a merchant and landowner who in 1761 had refused election as mayor of the city. All the names involved here have powerful Philadelphia associations. A seal is affixed to the sheet, intended to be removed and used "for sealing of Writs in our Court." Blockley, in which the land in question was located, was a township located in West Philadelphia from about 1677 until its consolidation with the city in 1854. The name has lingered, although it has been superceded in general usage by the broader term "University City. Parchment crisp and untorn, with outermost folded portions lightly spotted; front with early inked title as given above, plus pencilled numerals. An evocative document connected to some very prominent names, in excellent condition, with its seal protected for its intended reuse by a diamond-shaped paper covering. Rheinischer Antiquarius, Oder Ausführliche Beschreibung des Rheinstroms, Von seinem Ursprung an ... Auf das neue verbessert und vermehrt herausgegeben. Frankfurt und Leipzig, J. G. Eßlinger, 1776.. 8vo. Gestochenes Frontispiz, 4 Bl., 1030 S. mit 1 Textholzschnitt, 23 Bl. (Reg. u. Errata), insges. 18 gefaltete Tafeln, Karten u. Pläne. Halbpergament d. Zt.. Neue Ausgabe des umfassenden Werkes über den Rhein (zuerst 1739 erschienen), verfaßt für Reisende und Kunstliebhaber. - Enthält 2 Rheinlaufkarten (vom Ursprung bis Oppenheim, von Mainz bis zur Nordsee) und eine hübsche Bodenseekarte. Unter den Kupfertafeln ein Plan der Gegend von Rheinfels sowie Ansichten der Rheinfälle in Graubünden, bei Lauffen und bei Zurzach, von Mannheim, der Schwedischen Säule bei Oppenheim, des Mäuseturms, der Pfalz bei Kaub, der Festung Schenkenschanz, von St. Goar und Umgebung, Eichelstein, Brittenburg und vom Königstuhl bei Rense und eine Doppeltafel mit Darstellungen 8 römischer Kaiser im Dom zu Speyer. - Beschabt und bestoßen, vorderes Außengelenk unten mit ca. 8 cm langem Einriß. Innen leicht gebräunt, erste und letzte Lagen etwas braunfleckig. Voyage du Tour du Monde, Traduit de l'Italien de Gemelli Careri par M. L. N. [Eustache Le Noble ?]. Nouvelle (seconde) Edition augmente?e sur la derniere de l'Italien. & enrichie de nouvelles Figures. Tome Premier. De la Turquie [+ Tome Second. De la Perse. + Tome Troisieme. De l'Indostan. + Tome Quatrieme. De la Chine. + Tome Cinquieme. Des isles Philippines. + Tome Sixieme. De la Nouvelle Espagne.] A Paris, Chez Froulle, Libraire, Pont Notre-Dame, a Saint Jacques, M. DCC. LXXVI. Avec Approbation & Privilege du Roi. London: T. Cadell. 1776. 8vo., (6) + 128pp., wanting the half-title, early instruction in ink to binder on title-page, recent cloth-backed marbled boards with morocco label on upper cover lettered in gilt. A very good copy. First edition. Goldsmiths 11512. Kress 7243. Stammhammer II, p.258. Sabin 65452. Thomas, Stephens and Jones 19A1. Adams 76-118a. [together with], Additional observations on the nature and value of civil liberty, and the war with America: also observations on schemes for raising money by public loans; an historical deduction and analysis of the national debt; and a brief account of the debts and resources of France.> London: T. Cadell. 1777. 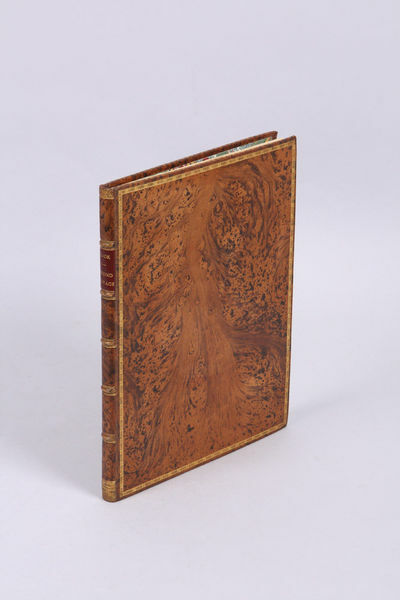 8vo., xvi + 176pp., recent cloth-backed marbled boards with morocco label on upper cover lettered in gilt. A very good copy. First edition. Kress B.71. Stammhammer II p.258. Sabin 65444. Thomas, Stephens and Jones 20a. Adams 77-75a. Only later editions in Goldsmiths. Essays of some significance in Anglo-American history. 'Price had started writing the work early in November 1775 and it had taken him the better part of the winter to complete it. The pamphlet's popularity, apart from its intrinsic merits, was due to the fact that it was a spirited defence of the American colonists published at a time when relations between the colonies and the Mother Country were deteriorating to the point of rebellion. The first part examines the nature of liberty, the principles of government, and the circumstances in which one society can claim authority over another. The second discusses whether war with America could be justified and whether Britain had any prospects of success. In the Conclusion Price summarizes a speech which the Earl of Sherburne had made in the House of Lords in the debate on the American Prohibitory Bill.' [Thomas et al. p.56]. Price had for several years before the outbreak of hostilities been sympathetic to the cause of the American colonists. As a non-conformist he had long championed the cause of the freedom of worship and been disappointed in the lack of progress made towards it in England. For this reason he was less likely to support the establishment and the conventions of government as they had developed in his own country. In particular he believed that government had no part to play in religion. His theories of civil society, inspired by Locke, and based on the idea of implicit contract, took seriously the claims that political society is the creation of all> its members. It followed naturally from this that Price was the enemy of imperialism since imperialism involved claims to rule a community which did not derive from the will or consent of the constituent peoples. Price's support of the American colonists made him almost at once one of the best known men in England. 'The pamphlet provoked an extensive controversy. Some thirty pamphlets appeared from some of the best known controversialists of the day: including Adam Ferguson, John William Fletcher, Henry Goodricke, Richard Hey, John Lind, James Macpherson, John Shebbeare, and John Wesley. The City of London made Price a Freeman in recognition of his services to the cause of liberty. The pamphlet was translated into French, Dutch and German. It marked Price's emergence as a figure of national, indeed international, importance.' [Thomas et al. p.56]. The Additional Observations> 'is divided into three parts. In the first Price extends the analysis and the assessment of the value of liberty that he had given in the earlier pamphlet and points to what he believes are the tendencies that threaten the enjoyment of it. Among these he includes the general indifference on the part of the public to political matters, the diminution of the power and influence of the Commons, failure to secure triennial Parliaments, the acceptance of a standing army, the tolerance of a high level of public indebtedness, lack of vigilance in the control of public expenditure, the dangers implicit in the conduct of the Commons over the Middlesex election, and the growth in the power of the Crown through having the East India Company thrown 'into its hands'.' [Thomas et al. p.81]. n.p., March 2, 1776. 7.5 x 5.5. "This particular example is ex-Sang collection. 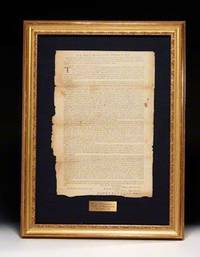 Virtually no other items of this date signed by Hart have been sold at major public auctions in the last 25 years, only this and one other Clark 1776 document ever sold. The document reads in full, ""This is to certify that Caleb Camp hath attented as a Deputy in Provintial [sic] Congress in New Jersey, sixty days in this and a siting at Trenton in October last for which he is intitiuled [sic] to receive eineteen [sic] pounds twelve shillings proclamation. "" The document is signed ""Abra Clark"" and ""John Hart."" Clark writes out the date as well as signing his own name. A tiny gouge at the right margin affecting one word has been neatly strengthened on the verso. The certificate is addressed to either of the Treasurers of the Provincial Congress. On the verso, the docket is signed by Silas Condict, New Jersey member of the Continental Congress and by Jesse Hand, who states the certificate has been ""examined and allowed"". Beneath their docket is an ADS of Camp acknowledging receipt of the money." Le Militaire Philosophe ou Difficultés sur la Religion proposées au R.P. Malebranche, Prêtre de l'Oratoire. Par un ancien Officier. Wienerisches Finger-Kalenderl für das Schaltjahr 1776. Wien, J. F. Baumgartner u. S. Härtl (1775). 70 x 25 mm. 22 nn.Bll., mit 12 Kupfertafeln u. 1 (mehrf. gef.) gest. Tabelle, Hldr. d. Zt. . . Sehr selten.- Im Klein-Hochformat erschienener Wiener Miniaturkalender mit 12 Trachtenkupfern (Engländer, Africaner, Persianer, Spanier, Bayrischer Bauer, Italiener, Polac, Gutter Teutscher, Ungar, Türck, Hollender, Franzos).- Titel mit kleinem Steuerstempel. Ohne die beiden Emailledeckeln.- Der Innenspiegel mit einem kleinen Spiegel, im hinteren Innenspiegel mit Stecktasche. à Londres (|& se trouve à Dresde cheez Conrad Walther): S.n., 1776. Fine. S.n., à Londres ( & se trouve à Dresde cheez Conrad Walther) 1776, 2 tomes en un Vol. Pet. in 4 (16,5x20cm), x (6) 431pp. (1), relié. - First edition, rare, of Canzler from Barbier (Dict. anonymous works). Title pages in red and black, illustrated with two vignettes. 43 tables flyers. Two figures of the orders of chivalry. The two volumes are continuous pagination. Half Calf fawn with small time corners. Back tooled raised florets 4 cold and cold nets; title and volume number struck cold. The work presents a complete military and political panorama of Sweden, mainly economic perspective, history, ... (spreading art, architecture ...) The author, as announced in preface, spent seven years in the country, taking care with the aim of its future work, attending scholars, libraries and anything that might serve his purpose. Trade, the country's finances are finely and carefully studied. --- Please note that the translation in english is done automatically, we apologize if the formulas are inaccurate. Contact us for any information! - [FRENCH VERSION FOLLOWS] Edition originale, rare, de Canzler d'après Barbier (Dict. des ouvrages anonymes). Pages de titres en rouge et noir, illustrées de deux vignettes. 43 tableaux dépliants. Deux figures des ordres de chevalerie. Les deux tomes sont à pagination continue. Reliure en demi veau fauve à petits coins d'époque. Dos à nerfs orné de 4 fleurons à froid et de filets à froid ; titre et tomaison frappés à froid. L'oeuvre présente un panorama complet de la Suède, essentiellement du point de vue économique, historique, militaire et politique... (écartant l'art, l'architecture...) L'auteur, comme l'annonce la préface, a vécu sept années dans le pays, en prenant soin dans le but de son ouvrage futur, de fréquenter les savants, les bibliothèques et tout ce qui pouvait servir son dessein. Le commerce, les finances du pays sont finement et scrupuleusement étudiés. [London: Thomas Hart, March 26, 1776].. Engraved mezzotint, 13 x 9 3/4 inches. Trimmed to the image, lacking the caption and imprint information. A bit of light creasing and a few small, closed edge tears. About very good. Matted and framed. 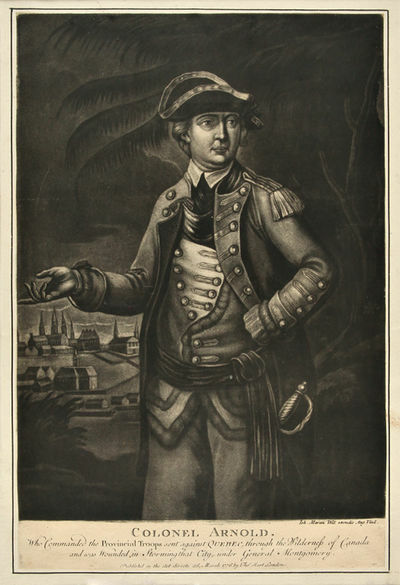 This attractive British mezzotint is the first portrait print of Benedict Arnold, who achieved renown for his successes as an American officer in the early years of the Revolution, but whose lasting reputation is as the most famous traitor in American history. The print depicts Arnold at the 1775 Battle of Quebec. He is shown from the knees up, dressed in an elaborate and neat uniform, his outstretched right arm pointing toward Quebec, which is shown in the background. The Battle of Quebec occurred on December 31, 1775, with the American forces led by Arnold and Richard Montgomery, and was an attempt to launch an early attack on British forces and to enlist French Canadians to the American cause. It failed badly, and would be the only American attempt to take control of Canada during the American Revolution. The American attack came after a long and difficult march to Quebec, and Arnold (and his men) would have been in much worse physical and sartorial condition than is depicted in this portrait. This mezzotint of Benedict Arnold is one of a series of fictitious portraits of military leaders done in London by R. Purcell (under the pseudonym "C. Corbutt"). Trimming mezzotints to the image was a common practice in the 18th century. CRESSWELL 9. THE ENGLISH SATIRICAL PRINT: THE AMERICAN REVOLUTION 51. BM CATALOGUE OF PRINTS 5331. Riga: Johann Fridrich Hartknoch 1776,. HLdr. der Zeit mit Rückengoldprägung, dreiseitiger roter Schnitt, 383; +210 Seiten, 19,5 x 24 cm, Einband leicht berieben und leicht angeschmutzt, Besitzerschild auf den vorderen Vorsätzen ("Le Chevalier Charles de Bohr"), Besitzervermerke auf den Vorsätzen, beide Titelblätter mit kleinem Besitzerstempel ("St.Quentin"), innen selten relativ kleine Stockflecken, Papier sonst noch ganz hell, ein oder zwei ganz kleine Bemerkungen mit Bleistift aus dem 19. Jh., beiliegend Kommentar zum Buch von einem Lesers (1864), insgesamt sehr guter Zustand..
London. 1776.. ,92pp. plus folding table. Lacks the half title. Modern three-quarter morocco and marbled boards, spine gilt. Modern bookplate on front pastedown. Negligible soiling. Very good plus. First edition of this important political tract, replying to the American Congress' "Declaration...setting forth the causes and necessity of their taking up arms," which is printed in the rear of the pamphlet. Authorship of this work is in doubt, Adams crediting James Macpherson, who was retained by Lord North as a political writer, and Howes crediting Sir John Dalrymple. The pamphlet, which was widely disseminated, sets forth the ministerial position on the situation in America. This is the first of over twenty editions, making it one of the most widely circulated pamphlets of the English side of the debate. Only a handful of copies of this edition are in ESTC. ESTC N12881. AMERICAN CONTROVERSY 75-95a. HOWES D37. à Mannheim: Chez C. F. Schwan, 1776. Fine. Chez C. F. Schwan, à Mannheim 1776, in-12 (10x18cm), XII ; 384pp., relié. - Edition illustrated with 15 boards connected in-fine. Contemporary binding in full mottled brown calf. Back with five nerves decorated with boxes and gilded florets. As red morocco room. Gilt rolls on the cuts and caps. All marbled edges. Corners slightly rubbed. Library buffer (little owl) on the first guard. - [FRENCH VERSION FOLLOWS] Edition originale illustrée de 15 planches reliées in-fine. Reliure de l'époque en pleine basane brune mouchetée. Dos à cinq nerfs orné de caissons et fleurons dorés. Pièce de titre de maroquin rouge. Roulette dorée sur les coupes et les coiffes. Toutes tranches marbrées. Coins très légèrement frottées. Rare ouvrage devenu une référence en minéralogie et en gemmologie. cette narration de voyage dans le palatinat, soutenu par l'électeur Palatin, est riche en observations mineralogiques de plusieurs sortes. 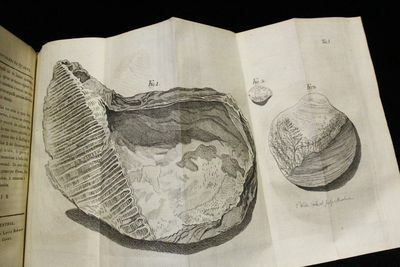 Suite à des considérations géologiques sur la rive gauche du Rhin, l'auteur décrit les fossiles et la nature des agates et jaspes trouvés dans les champs, les mines de mercure, leur constitution géologique et leur fonctionnement, la mine de cuivre, la mine d'agate dans les environs d'Oberstein. La description de la mine d'Agate laisse alors de côté la narration de voyage et donne lieu à un long traité sur la formation des agates, leurs couleurs et l'origine minéralogique de ces couleurs, leur dureté, et la façon dont on travaille ces agates à Oberstein. Il s'agit de la première description scientifique des agates. Le voyage reprend alors avec des considérations sur d'anciens volcans et des montagnes de basalte, près de Bonn. L'auteur, historien, fut secrétaire de Voltaire durant cinq années à Berlin et devint directeur du cabinet d'histoire naturelle de Manheim. Tampon de bibliothèque (petite chouette) sur la première garde. Recherches sur le calcul intégral aux différences partielles. à Paris: Chez Moutard, 1776. Fine. 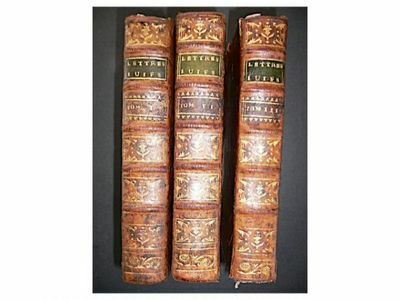 Chez Moutard, à Paris 1776, 3 tomes en 3 Vol. in 12 (9x16,5cm), xxvij (1) 424pp. et (4) 476pp. et (8) 444pp., relié. 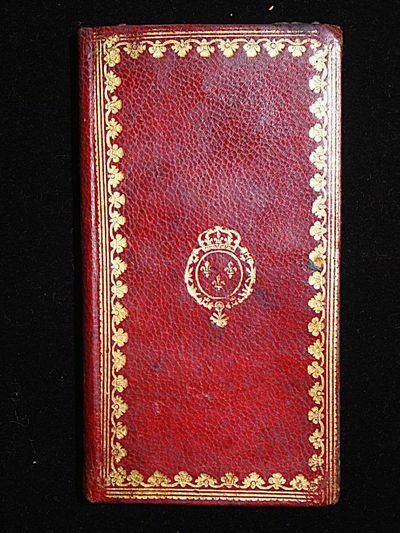 - Edition partly original, published for the first time in 1769 in a Vol. in 8. Two volumes were added for this edition. Full sheepskin vintage blonde. Back tooled raised. Part of title in red morocco. Petis gaps in mind. Tail headdress of Volume III threadbare. 7 corners bumped. Friction. The book is an attack and a critical review of the Treaty of tolerance Voltaire. The work was well received by both critics (Voltaire, d'Alembert) the public. The author demonstrated not only an argument nourished and erudite, but without pedantry and always with impartiality, that Voltaire applauded himself. Letters are not a defense of the church, but religion. As for style, Abbée Guenée establishes a dialogue with Voltaire, and his intention is clear, demonstrative, and not sententious. --- Please note that the translation in english is done automatically, we apologize if the formulas are inaccurate. Contact us for any information! - [FRENCH VERSION FOLLOWS] Edition en partie originale, publiée pour la première fois en 1769 en un Vol. in 8. Deux volumes furent ajoutés pour cette édition. Reliure en pleine basane blonde d'époque. Dos à nerfs orné. Pièce de titre en maroquin rouge. Petis manques en tête. Coiffe de queue du tome III élimée. 7 coins émoussés. Frottements. L'ouvrage est une attaque et un commentaire critique du Traité de la tolérance de Voltaire. L'oeuvre fut bien accepté tant par ses détracteurs (Voltaire, D'alembert) que le public. L'auteur y fait montre, non seulement d'une argumentation nourrie et érudite, mais sans pédanterie et toujours avec impartialité, ce que Voltaire applaudit lui-même. Les Lettres ne sont pas une défense de l'église, mais de la religion. Quant au style, l'abbée Guenée établit un dialogue avec Voltaire, et son propos est clair, démonstratif, et nullement sententieux. Evelyn, John and Hunter, A.
Presso la Società Tipografica 1776 Edizione originale. 2 voll. In 8°, p. XVI,304; (4)277(5, invece di 3, perché l'Errata del 1° vol. è legata alla fine del 2°). 6 tavole ripiegate incise da D. Cagnoni (2 alla fine del primo, 4 alla fine del secondo). Esemplare a pieni margini. Leggerissime fioriture. Bella legatura coeva in pelle con nervature, decorazioni e titolo in oro ai dorsi. (Gamba, 2449). Geschichte der Kunst des Alterthums. Nach dem Tode des Verfassers herausgegeben, und dem Fürsten Wenzel von Kaunitz-Rietberg gewidmet von der kaiserlichen königlichen Akademie der bildenden Künste. Erster [und] Zweyter Theil. Wien, Akademischer Verlag, 1776.. 2 Bände. Ca. 26,5 x 21,5 cm. 6 Blätter, LXXII Seiten, 618 Seiten; 1 Blatt, Seiten 619-881, 56 nn. Seiten Inhaltsverzeichnis und Register. Mit 22 gestochenen Vignetten, davon zwei auf den Titelblättern. Halblederbände der Zeit.. Zweite Ausgabe, posthum erschienen. Goedeke IV/1, 301, 12; Rümann 1276. Mit dem ausführlichen Vorwort von Friedrich Justus Riedel und dem häufig fehlenden "Verzeichnis der Subscribenten". Winckelmanns Kunstgeschichte ist eines der wichtigsten Bücher auf diesem Gebiet und bis heute prägend für das Verständnis der Antike. "Es war in der Tat das erste Werk in deutscher Sprache, das weltweite Zustimmung fand. Winckelmann wies hier zum ersten Mal auf die Wichtigkeit der griechischen Vorbilder für die moderne Welt hin ..." (Carter/Muir). Erster Teil mit allgemeinen Grundlagen und der Geschichte der Kunst der Ägypter, Perser und Römer, der zweite Teil ist ganz der griechischen Kunst gewidmet. Gelenke restauriert, Rücken mit kleinen Fehlstellen, Vorsätze erneuert. Exlibrisstempel auf den Vorsätzen, die ersten Blätter im 2. Teil am oberen weißen Rand gering wasserrandig. Philadelphia, PA 1776 - Pennsylvania Magazine: or American Monthly Museum. For February 1776. Philadelphia: R. Aitken, [March 6, 1776]. Complete with plate on page 74 showing sign language alphabet. -104 (49 pp. ), 5 1/4 x 8 1/4 in. With articles on "Arguments against playing at Cards on the Lord's day," a "Method of Manufacturing Gunpowder," and "Dumb Speech, or the Art of Conversing by the Fingers only, as well in the Dark as in the Light. ""Monthly Intelligence" covers the House of Commons Address to the King:"we have long lamented the condition of our unhappy fellow subjects in America; seduced from their allegiance, by the grossest misrepresentations, and the wicked and most insidious pretences, they have been made the instruments of the ambition and traiterous designs of those dangerous men, who have led them step by step to the standard of rebellion, who have now assumed the powers of sovereign authority, which they exercise in the most despotic and arbitrary manner, over the persons and properties of this deluded people." (pp. 91-92)Also, more than 10 pages on"General SCHUYLER'S account of this expedition to Tryon County (New York)" On December, 30, 1775, Schuyler was ordered to disarm disaffected inhabitants. The Continental Congress were so highly satisfied with his conduct in that delicate and meritorious service, as to declare, by a special resolution, that he had executed his trust and fidelity, prudence, and dispatch; and they ordered a publication of the narrative of his march in the depth of winter, into the regions bordering on the middle and upper Mohawk. This narrative and correspondence runs through last January, and recounts his movements, talks with the Mohawk Indians about the Patriot Cause, and much more. In part, "We beg of you brothers, to remember the engagement which was made with the Twelve United Colonies at our Interview last summer, as we then engaged to open the path of peace, and to keep it undefiled from blood.You assured us, brothers, that if any (Tories, Redcoats) were found in our neighborhood inimical to us, that you would consider them as enemies. The Six Nations then supposed that the son of Sir William [Johnson] was pointed at by that expression." (pp. 92-104).ConditionStab-stitched, disbound; last two leaves loose; some small marginal chips well clear of text; overall very good to fine condition. AVISOS MEDICOS, POPULARES, Y DOMESTICOS. Historia de todos los contagios: preservacion y medios de limpiar las casas, ropas, y muebles sospechosos. TROISIEME VOYAGE de COOK, ou Journal d'une expedition faite dans la Mer Pacifique du Sud & du Nord en 1776 - 1780. Paris,Chez Pissot pere & fils, Libraires, quai des Augustins & Laporte, Libraire, rue des Noyers,1782.FIRST FRENCH EDITION, 2nd state 1782, translated from the English by Jean - Nicolas Demeunier. 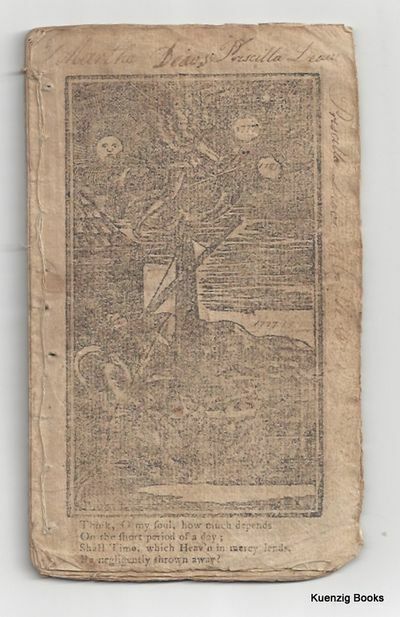 8vo, approximately 210 x 140 mm, 8¼ x 5½ inches, woodcut vignette of farm buildings and trees on title page, illustrated with a folding engraved frontispiece representing the death of Captain Cook on Hawaii, "Mort du Capitaine Cook à OWhy - hée, Fevrier 1779", and a folding engraved map showing the tracks of the Resolution and the Discovery, pages: x,  - 508 complete with half - title, final page has the Approbation and "De l'imprimerie de Valade". 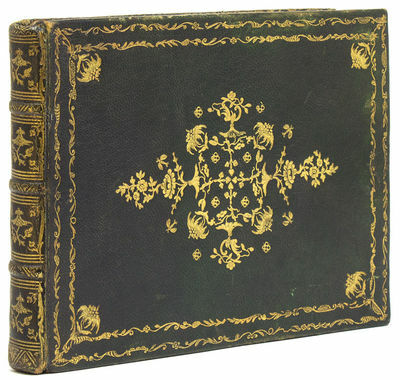 Still in its original French marbled wrappers and uncut, housed in a blue drop down box, with gilt letter leather label on spine, and the binder's name in gilt inside at the bottom of the spine " Newbold & Collins, Sydney". The binding is worn and rubbed, half the lower wrapper repaired with matching paper and ragged at edges, spine rubbed with loss of marbled paper, the folding map has some small neat repairs to blank side and one larger repair running into image, but no loss, text mostly clean and crisp with the occasional small brown spot, old ink manuscript notes on the blank side of rear wrapper, old ink name on title page, the same as shown in the image in the Parsons Collection of Rare Pacific Voyage Books by Hordern House, hard to read but looks like "Lestrange". Rare in original state. See: The Parsons Collection, Rare Pacific Voyage Books From the Collection of David Parsons, by Hordern House, Part 1, No. 123; David W. Forbes, Hawaiian National Bibliography 1780 - 1900, Volume 1, page 38, No.45. MORE IMAGES ATTACHED TO THIS LISTING, ALL ZOOMABLE, FURTHER IMAGES ON REQUEST. POSTAGE AT COST. Bath, England: Printed by R. Cruttwell, 1776. First edition. Later wrappers. Removed from a larger volume, lacking the half-title, untrimmed, early inscription identifying author on title page, later marbled wrappers, about very good.. Adams, American Controversy 76-134; Howes R373; Sabin 72154. ESTCT95753. NUC R0385294. Wolf, Lib. Benjamin Franklin 2193. Sowerby, Cat. of the Lib. of Thomas Jefferson 3056. JCB 2319. Argues for the legitimacy of the American protests and eventual independence. Follows upon the 1774 publication by the author, "Considerations on the measures carrying on with respect to the British colonies in North America. Paris.. 1776.. Etching, handcolored, 11 x 7 3/4 inches on sheet 17 x 11 inches. Very good condition. A beautiful image from Pierre Joseph Buchoz "COLLECTION PRECIEUSE ET ENLUMINEE des fleurs les plus belles et les pulus curieuses, qui se cultivent tant dans les jardins de la Chine que dans ceux de l'Europe". Designed to be "equally useful for naturalists, florists, painters and drawers, to directors of Porcelaine, Fayence, and silk, wool and cotton fabrics and other artists." The 100 etching / engravings of Chinese subjects were copied from Chinese drawings, and were instrumental in popularising the use of Chinese design. (Dunthorne, Flower and Fruit Prints #60). .